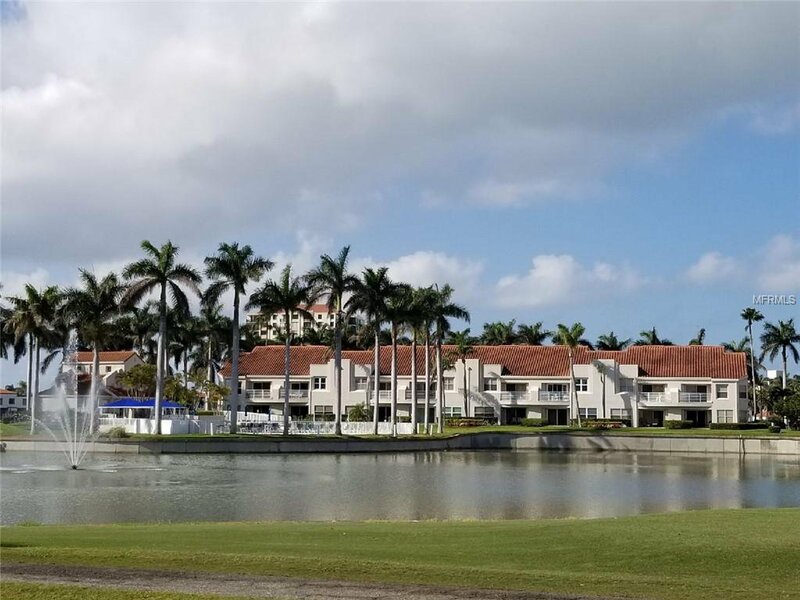 Highly sought after Vista Verde West 2nd floor condo on the 8th fairway of Isla Del Sol Championship Golf Course. This unit has vaulted ceilings in the Great Room & overlooks the beautiful pond with lighted fountain. From the balcony you can also see the community pool, spa & Clubhouse available for entertaining. The kitchen has eating space & breakfast bar & is open to the living room / dining room. Very open floorplan. Neutral ceramic tile throughout, with carpet in both bedrooms. Master bedroom has walk-in closet and ensuite bath with double sinks & large soaking tub. Split bedroom plan – the guest bedroom also has a walk-in closet. Side by side washer/dryer right in the condo. Being sold furnished & move-in ready. This could be your full-time residence, a 2nd home or an investment opportunity with the one week rental minimum. Conveniently located between St Pete Beach & Ft DeSoto Park. 10 minutes away from downtown St Petersburg's museums, restaurants, professional baseball & so much more. Close access to I-275 & Tampa Intl Airport. Memberships available separately for Isla Del Sol golf, tennis, marina & social. Assigned parking space #47. Make your dreams come true & live the Island Life! Listing courtesy of COLDWELL BANKER RESIDENTIAL. Selling Office: KELLER WILLIAMS ST PETE REALTY.